Photo: John Hite House, ca. 1753, U.S. Route 11, Bartonsville, VA. Listed on the National Register of Historic Places in 1982. Photographed by User:Joel Bradshaw (own work), 2010 [cc0-by-1.0 (creativecommons.org/publicdomain/zero/1.0/deed.en], via Wikimedia Commons, accessed July, 2015. The Frederick County Courthouse is located at 5 North Kent Street, Winchester, VA 22601; phone: 540-667-5770. Formed in 1743 from Orange County, Frederick was the home of George Washington for 10 years. The county seat is Winchester. The Colonial Government of Virginia wanted this wilderness settled as quickly as possible, as a buffer against the Native Americans; but Robert "King" Carter, Lord Fairfax's agent, was settling Fairfax's land slowly in large plantations. The Government of Virginia had chartered counties in the land grant as settlement spread up the Northern Neck and west through the land grant. Virginia began to argue that Fairfax's land grant ended at the Blue Ridge, and began granting up to 1,000 acres each to settler families west of the Blue Ridge. Abraham Hollingsworth settled near the site of Abrams Delight, now located within the Winchester City limits, in about 1729. Owen Thomas and Jeremiah Smith came to Back Creek in 1730 and settled on 806 acres granted in Thomas' name. Smith left and returned with a wife before 1741. His log cabin is now part of a house west of Back Creek and south of Route 50. In 1732, Jost Hite settled 16 families on his 5,000 acre "grant" and built Hite's Fort at Bartonsville, located on Route 11, approximately two miles south of Winchester. The "Indian Path" became the Great Wagon Road to Philadelphia and Native Americans were dispossessed westward by treaty and force of arms. Frederick County was created from western Orange County by the House of Burgesses on December 21, 1738, and was named after Frederick Louis, the Prince of Wales and son of King George II, and originally spanned from the Blue Ridge Mountains to current day Ohio. In 1744, James Wood, County Surveyor for Orange County, platted a town at the County seat, which he named Winchester, after his birthplace. It consisted of 26 half-acre lots and three streets within 1300 acres, which he claimed as wilderness land owned by Virginia. Those streets are now Loudoun, Boscawen and Cameron. Winchester was officially chartered in 1752. County government in Virginia was originally by self-perpetuating courts. Frederick County's Court was proclaimed and organized in 1743, and its officials took their oaths of office on November 11th of that year. The Frederick County Court first met at the surveying office of its clerk, James Wood, at the site on which he later built his estate, Glen Burnie. By the mid-1740s, the Frederick County Court had acknowledged that Lord Fairfax's land grant did include Frederick County, despite previous arguments that the Fairfax lands ended at the Blue Ridge Mountains. At the age of 16, George Washington was a member of a surveying party that came to Frederick County for Lord Fairfax in 1748. 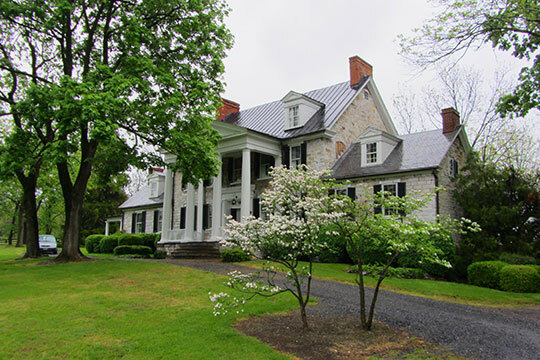 In 1749, Lord Fairfax moved to Frederick County and built his home, Greenway Court, at White Post, in present-day Clarke County. He accepted Wood's 1,300 acre claim and other additional lots at Winchester. Eventually, 11 other counties would be created from the 3,824 square miles included in the original Frederick County. George Washington maintained a relationship with Winchester and Frederick County during and after his surveying expedition for Lord Fairfax. Early during those years, Washington operated his surveying office in Winchester and oversaw the construction of Fort Loudoun. Washington's first elected office was as a representative of Frederick County in the House of Burgesses 1758. He served in this post for 15 years. During the French and Indian War, he was given a Commission by Governor Dinwiddie of Virginia and was later promoted to Commander in Chief of the colonial forces with headquarters in Winchester. The location of the headquarters for the western campaign helped to stimulate growth in Winchester throughout the French and Indian War which in turn led to improvements along trade/travel roads, the creation of additional lots in Winchester, and the formation of Stephensburg, which is now Stephens City. Although there were no battles or military engagements in Frederick County during the Revolutionary War, the area was very important in the effort. Prior to the drafting of the Declaration of Independence, a group of protesters met in Winchester to protest King George's taxes on the colonies. They drafted the Frederick County Resolves and promised not to purchase English wares until their grievances were resolved. During the war, General Daniel Morgan, who lived in eastern Frederick County (now Clarke County), and his "Long Rifles" played a prominent role in many battles of the Revolutionary War, including the Battle at Cowpens in South Carolina. His regiment of expert riflemen was one of two from Virginia. Several local citizens furnished the troops with food and supplies, including Isaac Zane Jr. who supplied the army with ammunition made at his ironworks in Marlboro. Many prisoners captured during the War were held in Winchester and Frederick County. By 1779, the number of British prisoners held in Winchester had increased beyond the capacity of the existing prison and a larger one was built. A barracks was built four miles west of Winchester to hold these prisoners whose number had increased to 1,600 by the year 1781. During the late eighteenth and early nineteenth centuries, life in Frederick County centered on small family farms and transportation and trade routes. By the 1770s, the Indian Warpath through Frederick County had transformed into the Great Wagon Road and forms what is now US Route 11. In addition to Route 11, other major roads were established through Winchester including what are now Route 50 West, 522 South, and Route 7 East. These four major roads provided avenues of transportation and made trade possible across the state of Virginia as well as major cities North and South of Virginia. As a result, Winchester and the surrounding area grew in terms of residential occupants and commercial occupants. Economic life was centered around Winchester and other local towns including Stephens City, Middletown, Kernstown, Gainesboro and Gore, which remain centers of economic and community growth today. There were a large number and diversity of craftsmen and merchants in these towns. The strongest influence on the local economy was the Great Wagon Road which carried settlers and travelers from Philadelphia, south through the Valley and to the west. Activity associated with this road made Winchester one of the largest towns in western Virginia. Farming in this region focused on several main crops which grew well in the soils of the area. During this period, wheat production became the center of the local economy, along with cattle farming, and by 1810, Frederick County was one of the largest producers of wheat in Virginia. Economic growth in the area was predominantly encouraged by agricultural activities and their industrial counterparts, such as milling and transporting of the locally grown products. By 1820, there were fifty flour mills in Frederick County along with numerous sawmills, tanneries, and other business activities. Growth in the area continued into the mid-nineteenth century, when the County was faced with Civil War and the turbulence that this area felt as a consequence of its location at the crossroads of many major roads and railroads.